Since the 1970’s Patrick McGurn and his family have farmed the 41ha holding at Kesh, Co Fermanagh as a part time venture. This area supports a unique landscape – internationally important wet grassland sites interspersed within the catchments of Lough Neagh & Lough Erne, yet poor soils mean 93% of the area is classified as SDA land, making farming in one of the wettest areas of Northern Ireland a challenge. 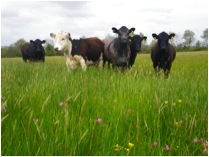 The farm itself supports a range of habitats – species rich rush pasture, fen meadow, lowland hay meadow, lowland raised bog, wet woodland & mixed ash woodlands. 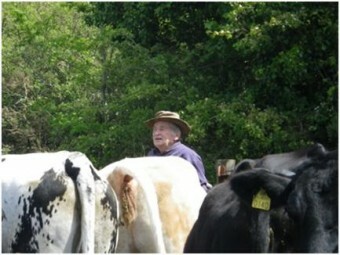 Patrick and his son run a herd of 15 suckler cows, calving in spring and sold locally to market at approximately 6 months old. All the land, except the raised bog, needs some type of cutting each year. This has been supported through the LFA Compensatory scheme and ESA. The ESA agreement expired this February and Patrick is concerned about the future direction of the farm as this will greatly depend on what future support mechanisms are available to him and his business. They recount stories of the past, being kept awake by corncrake but with the last confirmed breeding record for NI in 2007, Patrick is determined that the curlew doesn’t suffer the same fate. 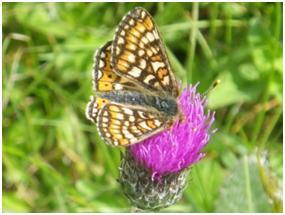 They will continue to take pride in their land and manage it for farming and wildlife for as long as they feasibly can.